There's a striking beauty to the new 2019 Volvo V90 Cross Country. While it is clearly built for adventure, this luxury wagon is also packed with versatility and comes in four distinct trim levels that highlight its Scandinavian design and Swedish craftsmanship. The team at The Wynn Group in Norristown, PA truly believes that its loyal and discerning customers will absolutely fall in love with the 2019 Volvo V90 Cross Country. For that reason, let's take a closer look at all that it has to offer. Powering the 2019 Volvo V90 Cross County are two impressive 2.0-liter engines. The first is a Direct-Injected Turbocharged engine that is standard on the T5 models and puts out 250 horsepower at 5,500 rpm and 258 lb.-ft. of torque at 4,800 rpm. If you step up to the T6 AWD level, you get a 2.0L direct-injected turbocharged and supercharged engine that produces a robust 316 horsepower at 5,700 rpm and 295 lb.-ft. of torque at 5,400 rpm. When you combine these powertrains with the eight-speed Geartronic automatic transmission with Start/Stop and Adaptive Shift you can expect an EPA-estimated of up to 34-mpg highway and 24-mpg city in fuel economy. All the Volvo V90 Cross Country AWD trims give drivers a fantastic ride because of the Instant Traction function that has an electronic management system that constantly monitors the speed of the wheels, the throttle, engine torque, engine speed, and the brakes. Other standard and available performance features include Drive Mode Settings (Comfort, Eco, Dynamic, Off-road, and Individual), premium rear air suspension, and Electrical Power Steering Personalization. When it comes to Ford trucks and commercials, a lot of focus understandably goes to the all-conquering F-Series, and rightly so. But for very specific commercial applications of hugely varying types, the E-Series is a strong option, especially the 2019 Ford E-Series Cutaway. 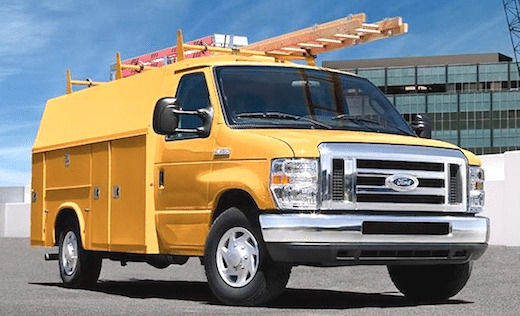 The Ford E-Series Cutaway is basically the E-Series van without a back on it, and that's the key to its incredible versatility. A lot of media exposure is understandably concentrated on retail trucks like the F-Series, but the amount of commercial vehicles our businesses and other bodies need means it’s a big market that's vitally important to manufacturers. So, let's take a closer look at the latest Ford E-Series Cutaway range. There are three models to choose between in the 2019 E-Series Cutaway family and they are the E-350 SRW, the E-350 DRW and the E-450 DRW. The E-350 SRW is the most light-duty model with single rear wheels, the E-350 DRW is the same vehicle with the extra capability of dual rear wheels, and the E-450 DRW is the most capable dual rear-wheel model in the range. Like heavy-duty trucks such as the Super Duty, there are two engines in the E-Series Cutaway range. Unlike the F-Series though, neither is a diesel. The standard engine is a 6.2-liter flex-fuel V-8 that's rated at 331 horsepower and 356 lb.-ft. of torque. It's a single overhead cam design with dual-equal variable cam timing, which is a feature for optimizing power across the full power band. The beauty of this engine is it's available with the CNG/Propane Gaseous Engine Prep Package, which converts the powerplant to run on compressed natural gas or liquefied propane autogas instead of conventional unleaded. The optional engine is a 6.8-liter Triton V-10, and this is the way to go if you have particularly demanding work in mind for your vehicle. At 363 horsepower it's more powerful than the 6.2, but it's the class-leading 420 lb.-ft. torque rating that's the real headline news with this engine. Buyers rarely want a completely stripped down, no-frills commercial these days, so the E-Series Cutaway has a good amount of standard features. Only your imagination and budget can restrict the possibilities for the E-Series Cutaway. Ford offers a number of prep-packages to make the E-Series ready for conversion, but much of the work will be carried out on a bespoke basis by aftermarket suppliers and upfitters. From the factory Ford can prep the E-Series Cutaway with Ambulance, Motorhome, Shuttle Bus, School Bus, and Multifunction School Activity Bus and prep-packages. The E350 SRW has a GVWR of 10,050 pounds and a maximum payload (minus body weight) of 5,190 pounds, when properly equipped. The DRW version of the 350 increases that to a 12,500-pound GVWR and a 7,650-pound payload, and the E-450 takes things all the way to a maximum GVWR of 22,000 pounds and maximum payload of 9,040 pounds. For more details about our inventory and expert help in finding the right 2019 Ford E-Series Cutaway for your needs, don’t hesitate to get in touch with us today here at South Bay Ford Commercial.